Why Do Wines Come In Different Shaped Wine Bottles? Just like people, wine bottle shapes vary greatly. They run the gamut from short and squatty to tall and elegant – from traditional to funky (depending upon how creative the winery’s marketing department was feeling that particular day). Usually, wine bottle shapes reflect the area from where the wine grape hails. For instance, Pinot Noir and Chardonnay usually have wine bottle shapes reminiscent of those found in Burgundy, the area where those grape originated. Cabernet Sauvignon, Merlot and Malbec on the other hand usually come in wine bottle shapes similar to those of Bordeaux, the region of their origins. For the purpose of this blog, we’ve identified the six most common wine bottle shapes found in the US. Their origins go back to western Europe and US winemakers have generally stayed true to the wine bottle shapes used in Europe. Why wine bottle shapes vary is an area of considerable debate among wine historians and a surefire cure for insomnia for most people. My belief is that the shapes go back far enough where there was little or no interplay between the wine making regions so each region developed their own shape. In the middle ages, most people never traveled more than 20 miles from their homes so it’s not surprising that bottle shapes Bordeaux, Burgundy and the Rhone region of France would develop independently given that they are hundreds of miles apart. 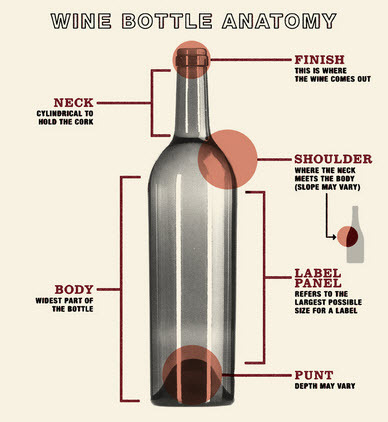 Understanding wine bottle shapes means understanding the key parts of a wine bottle. This graphic, developed by greenhousewinery.com, provides an excellent overview of a wine bottle. it allows for the “one handed pour” by placing the thumb in the punt and the fingers on top of the bottle. the punt somehow “magically”captures sediments that otherwise would cloud the wine in a glass. You can probably tell how much stock I put in this “magical” theory. Wine bottle color also plays a role in wine bottles. For the most part, darker bottles better protect the wine from light which can damage it. Red wines almost always used dark green colored bottles because the darker liquid can easily be seen through the dark glass. White wines and most roses however, use clear bottles. The lighter color liquid shows better through clear glass and wine color, particularly with lighter wines, can be an important clue as to how it will taste. If there is a classic wine bottle shape used in the U.S., this is it. The Bordeaux shape has straight sides, with shoulders that cut in sharply towards the neck and sit high up on the bottle. Typical wines that use this bottle shape are Cabernet Sauvignon, Cabernet Franc, Merlot, Malbec, Sauvignon Blanc, Chenin Blanc, and Semillon. Bordeaux blends from France or Meritage blends from the U.S. would also use this. This has become the go to bottle for winemakers who want to standardize on a single wine bottle shape. Most Italian and Spanish wines also use this form factor. The Burgundy wine bottle shape is quite different than Bordeaux bottles. The Burgundian wine bottle is wider at the base and rather than the abrupt transition from the neck to the shoulders like the Bordeaux shaped wine bottle, there is a gentle transition from wine bottle neck to shoulders and into the body. The lines are very graceful and flowing. The most common wines found in Burgundy wine bottle shapes are Pinot Noir and Chardonnay. The classic Rhone wine bottle shape is very similar to the Burgundian bottles. In the US, most winemakers standardize on one or the other for their Rhone and Burgundy wines but in France, its a matter of regional pride to make sure that bottles from the Rhone are kept in Rhone style bottles. Rhone shaped wine bottles are often marginally taller than those from Burgundy and have a slightly longer neck. Many wineries in the Rhone region emboss a seal or coat of arms on their bottles that is rarely done in the U.S. due to cost. Syrah is the most common wine found in this type of bottle but Grenache, Mourvedre, Viognier, Roussanne and Marsanne are also likely candidates to be served in this wine bottle shape. Champagne bottles are similar in shape to those from Burgundy but they are much thicker and heavier and that thick glass serves a very important purpose. Champagne is the one wine on this list that is carbonated and the pressure from that carbonation equates to five times the normal atmospheric pressure. All of that wine and CO2 needs to be contained, hence the thicker glass. FYI, a Champagne cork can travel at close to 30 miles per hour just after it is uncorked if left to fly on its own. One of our favorite bartenders from years past, lost the site in one eye from an unrestrained Champagne cork flying out of the bottle. Be careful! Champagne wine bottles are almost always dark green in color. By the way, what is the most common grape found in Champagne bottles? Good question. Champagne has an unusual distinction.. and no…it’s not because it has bubbles or has a reputation for giving really nasty hangovers if you drink the cheap stuff. It is one of the very few French wines that is still known in the U.S., by the area from which it originated, not by the grape type that made it. There is no “Champagne” grape. Most Champagne is made from either Pinot Noir, Pinot Meunier or Chardonnay wine grapes. Wine bottle shapes from the Rhine region of Germany are usually the tallest of the “standard” shapes found in the U.S.. Elegant and slender, these bottles look great on display but can reek havoc with many U.S. wine racks that are designed with French wine bottles in mind. There is also a very small punt in the bottom of the bottle. The most common wines found in Rhine shaped wine bottles are Riesling and Gewürztraminer. Wine bottle shapes from the Mosel Valley in Germany or the Alsace region of France are very similar to those from the Rhine region of Germany with the main difference being the color of the glass. Mosel and Alsatian wines virtually always come in light green or even clear glass in a few cases. The most common type of wine found in these types of bottles is Riesling. Those are the most common wine bottle shapes found in the U.S.. There are others that are very specific for smaller niche wines like the very tall necked Chianti bottles or short and fat port bottles but they are not often seen in mainstream stores or restaurants.